Life is hard. This isn’t a complaint as much as it’s a fact, yet we all try our best to hide this fact from the people around us. Maybe this has something to do with personal pride, maybe it has something to do with not letting things get us down. Either way, life has a way of putting us in our place and making us humble. However, when we openly admit that life is hard and that something is getting us down, we feel better. 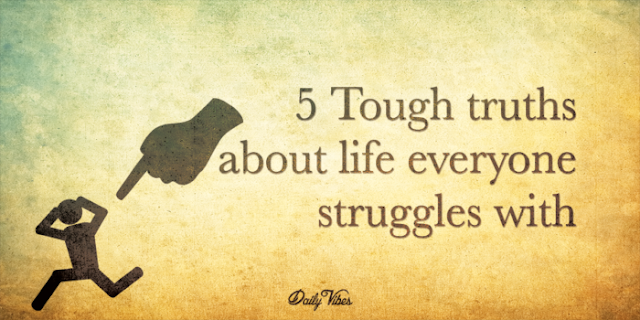 If you’re worried about something in your life that’s bringing you down, and you don’t want to admit it to the people around you, check out these five tough truths about life that everyone experiences. It may just give you the courage you need to admit it to yourself, and grow from the hardship. When we’re in control, everything seems better. The problem with being in control is that there are a number of things we experience every day that we simply can’t have control over. The good news is that we can control how we respond to these things, and this gives us the power to live our lives on our terms. Take control of your responses. Unfortunately, our expectations in life are our greatest source of unhappiness. We all have plans for our lives, but as most of us know already, these plans rarely work out the way that they want them to. This is just life, and there’s no reason why the unexpected should make us unhappy. Let go of what you think your life should look like and you’ll be happier. Nothing is ever going to be perfect, especially not you. We all need to get rid of the perfect standard we’re trying to live up to and just be human. Focusing on all the imperfections in the world will only bring us anxiety. There is no perfect version of ourselves, only who we are. Realizing this will lift a massive weight of your shoulders. We often convolute our lives with responsibilities that have nothing to do with work, school, or anything else really productive. This may mean we’re busy, but it certainly doesn’t mean we’re productive. Reprioritize in order to get back to what really matters to you in life; you’ll be happier. Everyone thinks they need more in order to be happy, but it’s most likely the opposite. Just like organizing your house or apartment, life gets easier when we subtract the things that cause clutter. Take a look at what you need and what you don’t, and you’ll see how cluttered your life already is.